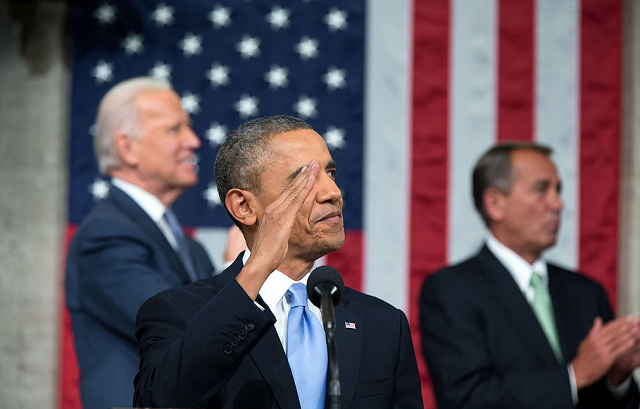 President Obama has delivered his last State of the Union address and thoughtful assessments of it can be found here  and here . But in this post I want to look more closely at what the speech tells us about Obama’s strategic policy. The recent publication of Fred Kaplan’s essay in Foreign Affairs—‘Obama’s way’ —explores Obama’s foreign policy record. But after seven years in office, what can be said about the narrower topic of strategic policy? Kaplan takes as his template for measuring Obama’s foreign policy record the president’s Nobel Prize acceptance speech  in Oslo in December 2009. I’m not sure this is an ideal template for measuring strategic policy success—it reads more like a modern liberal statesman’s search for a moral compass than a framework for US strategic thinking. So I’m proposing to use a different metric to compare ‘early’ Obama with ‘late’ Obama. There’s something of a Goldilocks quality to the four points—an insistence that the porridge be neither too hot nor too cold. Still, the State of the Union speech confirms all four judgments. Let’s start with the leadership point. The president chooses to focus on US global leadership as one of his four major themes. He likes the middle ground: ‘[keeping] America safe and strong without either isolating ourselves or trying to nation-build everywhere’. Many of his examples of leadership tend to be the humble, ethical ones: leading coalitions against Ebola, fighting climate change, eradicating HIV/AIDS. He sees no challenge to US leadership: ‘when it comes to every important international issue, people of the world do not look to Beijing or Moscow to lead—they call us’. Second, on the use of force issue, Obama speaks of ‘a wise application of military power’, and a ‘world [that] respects us not just for our arsenal’. In place of military force, he continues to champion ‘a patient and disciplined strategy that uses every element of our national power’. He doesn’t talk of the fracturing of US domestic opinion on distant military engagement, but does argue for global coalitions to address problems like Syria and the Iranian nuclear issue. Virtually all of his references to the direct use of military power occur in the context of counterterrorism. And that, in turn, reinforces the third point—the president’s vision of the threat spectrum hasn’t changed. Terrorism remains his number one priority in terms of keeping Americans safe, even though he accepts that terrorists don’t constitute an existential threat to the US. In his speech he points to the breadth of coalition efforts: ‘to cut off ISIL’s financing, disrupt their plots, stop the flow of terrorist fighters and stamp out their vicious ideology…We’re taking out their leadership, their oil, their training camps, their weapons…Just ask Osama bin Laden.’ Beyond the terrorist threat, Obama didn’t focus on the challenge of other great powers, which seems to be driving the nuclear modernisation effort and the idea of the Third Offset, but on instability. Finally, the president remains opposed to nation building abroad. ‘We…can’t try to take over and rebuild every country that falls into crisis, even if it’s done with the best of intentions. That’s…a recipe for quagmire’. There’s a continuing emphasis on domestic challenges and reviving the US economy—but perhaps a shade less emphasis now on the notion of rebuilding the American middle class as a key means of ensuring a future American age. Obama probably still believes in the principle, but the objective has been hard to realise. The middle class is struggling in America. We shouldn’t overlook what’s not in the speech. There’s no vision of what a new world order might look like. There’s no doctrine of enmeshment of rising powers. There’s little in the way of democratic enlargement after the bitter fruits of the Arab spring. And there’s a stubborn denial of the fact that US relative strategic weight is decreasing as other powers rise. Kaplan, in his essay, concludes that patience and pragmatism are the hallmarks of Obama’s foreign policy. We might also reasonably conclude that there’s been a central consistency to his core strategic policy settings, though consistency is only one measure’s of a policy’s success. Still, those settings aren’t about to change in Obama’s final year. Rod Lyon is a senior fellow at ASPI. Image courtesy of Twitter user @BarackObama.